The Conscious Kitchen, a SF Bay Area Milagro Foundation grantee, is supported by an ongoing partnership with Graystone Builders Inc., of New Hampshire. Graystone Builders has donated $65,000 to the Milagro Foundation! Graystone sells custom homes and offers upgrades to the client when they make a donation to Carlos Santana's Milagro Foundation. 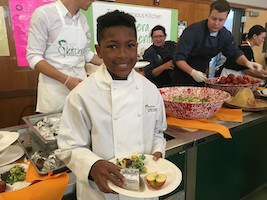 The client's donation helps provide food equity to underserved school children through The Conscious Kitchen.